I’ve had requests for tips on great driving holidays with kids. 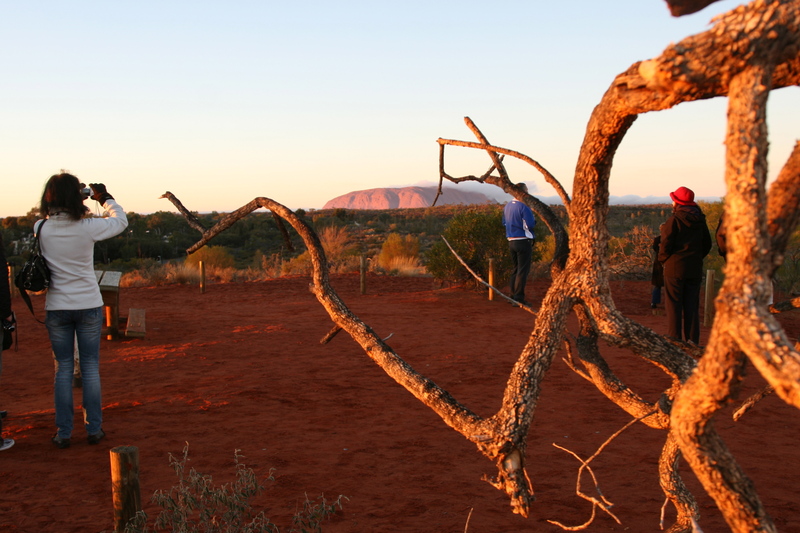 Here’s one of the best – a trip we did a few years ago from Alice Springs to Uluru via the Mereenie Loop. The unsealed section of the road is currently being upgraded. Nothing takes me back to my childhood like a driving holiday. The pre-dawn start, the ubiquitous eucalypts flashing by the window, a deck of cards and a colouring book the only weapons to battle boredom – any destination was paradise after an eternity trapped in the car! And even though my parents really tested me on a trip from Melbourne to Townsville, I still rate driving holidays as the ultimate family adventure. And when it comes to the ideal destination, Australia’s red centre is right up there. across more than 3000km of desert to get to Uluru. But if, like me, you’re a bit too soft for that, there is another way to experience the outback in all its heart-stopping majesty and that’s by taking a short cut – flying into Alice Springs, renting a 4WD and taking the back road to Uluru, via the Mereenie Loop Road. The drive is rated one of the best in Australia. The trip can be done in just over a week and is best tackled in the winter months with another family. Our children were nine and eleven when we did the trip. Here’s how we did it. around lunch time, pick up our 4WD and head straight for the supermarket to stock up on lunch supplies and snacks, (bring an esky – you won’t find too many cafes out this way) then head west out of Alice into the West MacDonnell Ranges. Our stop for the night is the Glen Helen Lodge – overlooking a spectacular gorge. The motel rooms are modest but the meals are good and so is the location. Here, you can buy a Mereenie Loop permit, needed to cross the Aboriginal land on the next leg of the journey. 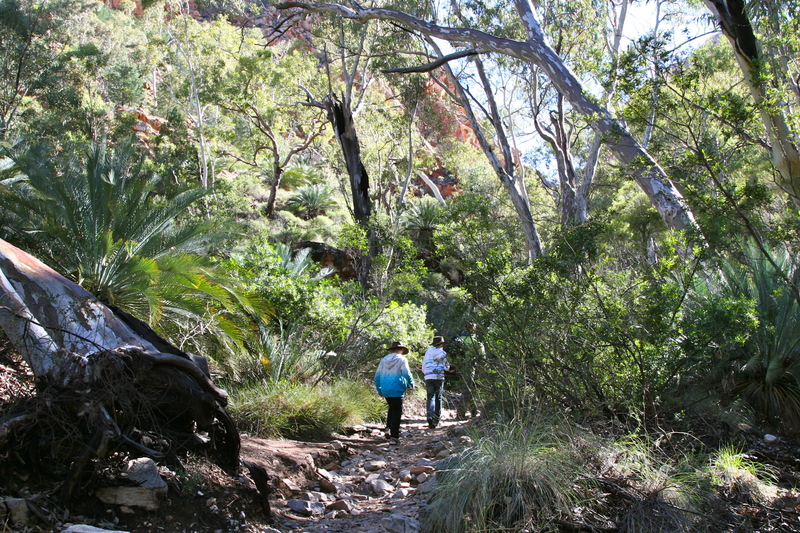 The cycad-lined track to Standley Chasm in the MacDonnell Ranges. 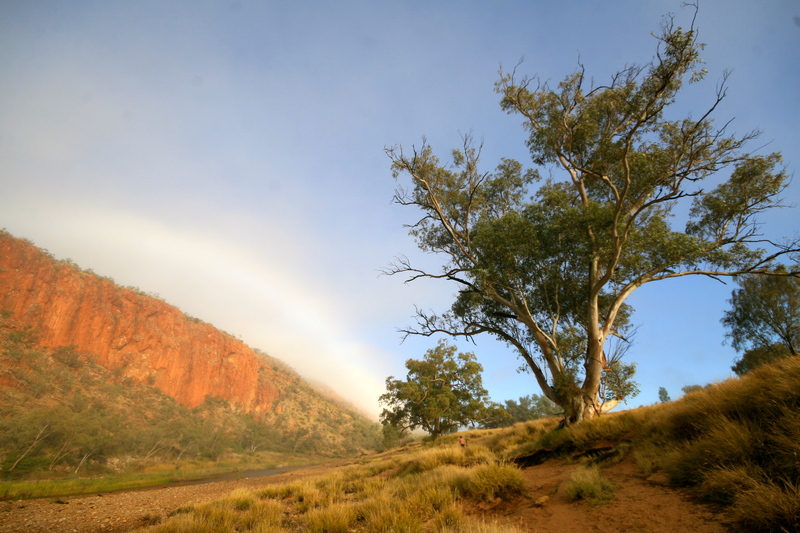 Day 2: Glen Helen to Kings Creek Station – We set off with a thick mist hanging over the MacDonnell Ranges, but by the time we hit the dirt road, the mist has burned off, and it’s a classic outback scene – a cobalt blue sky, desert oaks and paddy melon vines covering the red earth. We travel 155 km along the Mereenie Road, past giant meteorite craters, camels, wedge-tailed eagles and the rusting remains of cars that weren’t built for the outback. 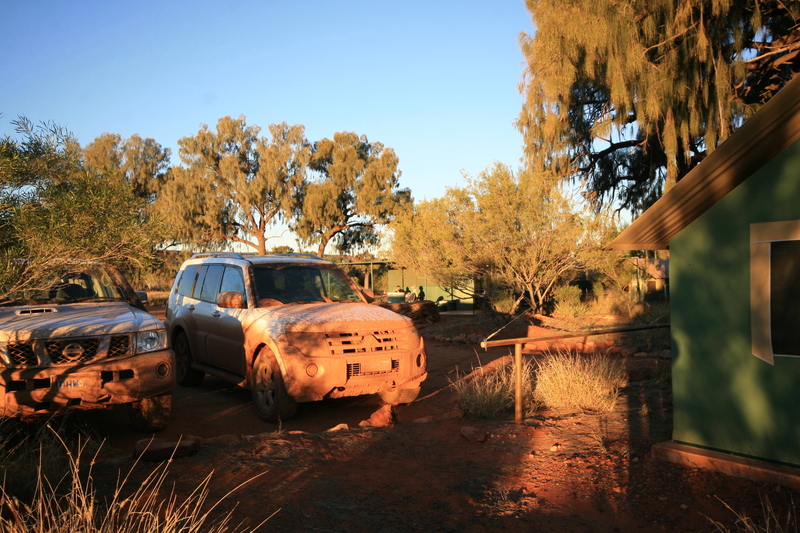 The unsealed road, has recently been graded, sparing us too much discomfort but the recent rain means the car is covered in red mud by the time we reach Kings Canyon (very authentic). We spend the next two nights at a working camel and cattle station – Kings Creek Station, staying in permanent tents, which are small but comfortable, and thankfully equipped with oil heaters. (It gets very cold in the middle of winter!) The station is well set up for visitors. Our kids make the most of camp life, enjoying the communal fire and the camel rides, but don’t like the idea of the camel burgers from the kiosk. 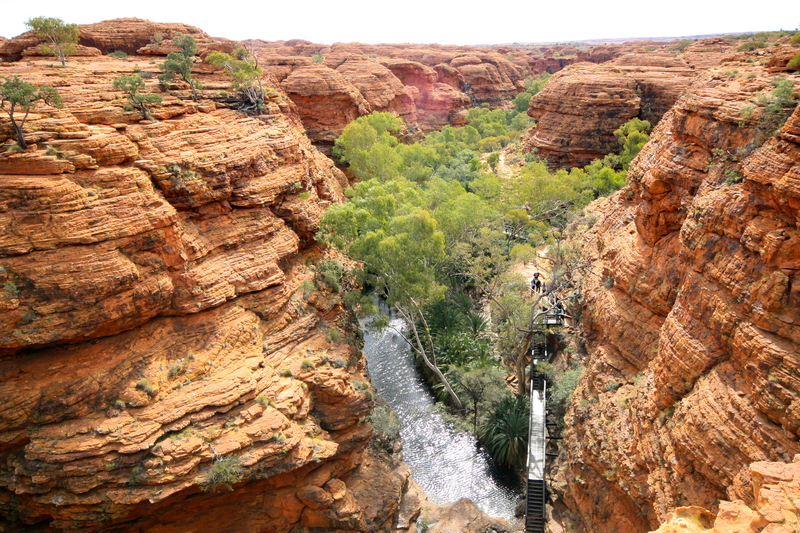 The station is a good base for exploring Kings Canyon, a 270-metre-deep ravine in the George Gill Range. The best views of the Canyon are from the Rim Walk. The four-hour circuit starts with a steep incline, then follows the rim for six km through beehive domes and eventually ends up back at the car park. A detour to the Garden of Eden, with its permanent water holes and giant cycads is definitely worth the effort. Day 4: Kings Creek Station to Uluru – From Kings Creek Station it’s another 260 km to the Uluru-Kata Tjuta National Park. 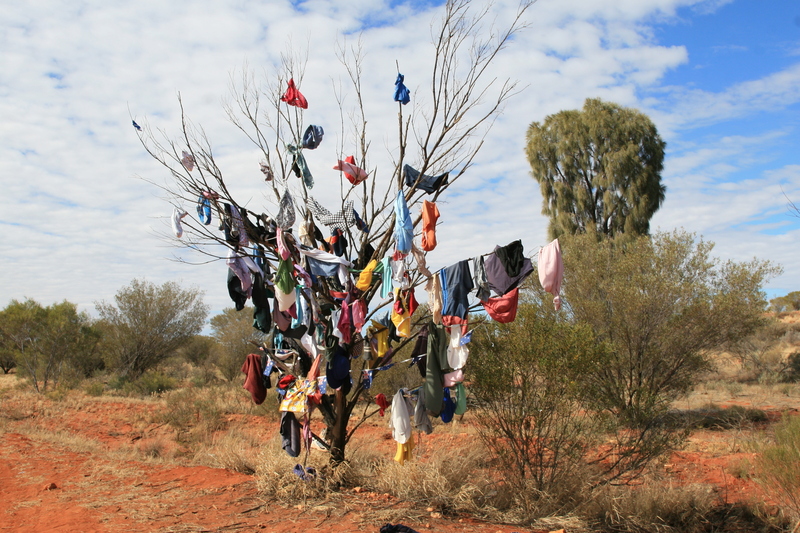 The road is sealed and less dramatic than the Mereenie Loop, but there are still several points of interest – a dead tree decorated with underwear, as well as the Curtin Springs Roadhouse, which boasts a very charismatic emu, but don’t bother asking for a cappuccino. Then comes Uluru itself – an incredible sight, especially if you’ve driven more than 400 km to see it. We have no trouble filling in three days at the National Park: exploring the wave-shaped caves at the base of Uluru, traversing the Valley of the Winds at nearby Kata Tjuta and trying to snap the ultimate sunrise over the Rock photo. The Cultural Centre is also worth a visit for information on the local area and the cultural significance of Uluru. Day 8: Standley Chasm – Our friends spend the last morning exploring the art galleries of Alice Springs, but we backtrack into the West MacDonnell Ranges and visit Standley Chasm. It’s just one of a chain of chasms and gorges that make up the Ranges, and it would be easy to spend a week or more exploring them all. We’ve only got a few hours to see the chasm, and follow a cycad-lined creek that eventually spills through a towering rock wall – a hidden desert oasis. Then it’s time to return the 4WD and board our flight for Brisbane – and prepare for our next adventure. 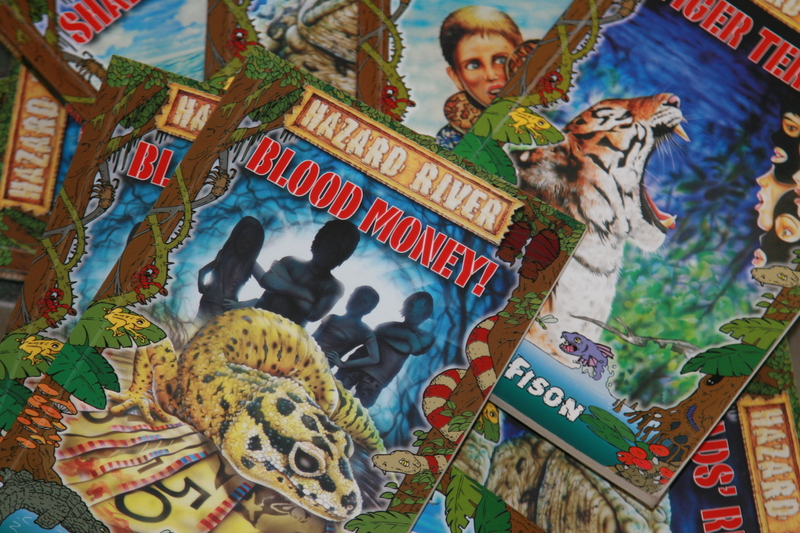 Find out about the HAZARD RIVER series. Thanks Megan. You and the kids will love it!